The new KOBOLD flow meter Type MIK is used for measuring and monitoring smaller and medium-sized flow of conductivity liquids in pipes. The device operates according to the electromagnetic measurement principle. According to Faraday’s Law of magnetic induction a voltage is induced in a conductor moving through a magnetic field. The electrically conductive measuring agent acts as the moved conductor. The voltage induced in the measuring agent is proportional to the flow velocity and is therefore a value for the volumetric flow. The flowing media must have a minimum conductivity. The induced voltage is picked up by two sensing electrodes which are in contact with the measuring agent and sent to the measuring amplifier. The flow rate will be calculated based on the cross sectional area of the pipe. The measurement is not depending on the process liquid and its material properties such as density, viscosity and temperature. The device may be equipped with a switch, frequency or analogue output. Moreover, there is a compact electronic system to be selected from, which contains a switch and an analogue output. The device series is completed by an optionally obtainable dosing and counter electronic system. The counter electronics system shows the current flow rate on the first line of the display and shows the partial or overall volume on the second line. 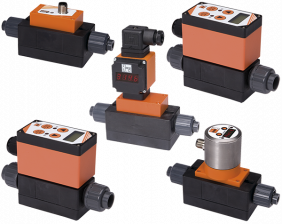 A dosing electronic system controls simple filling duties and also measures the flow rate, overall volume and filling volume. The analogue output and two relay outputs can be utilised for the further processing of signals.